What draws me back to Thomas Bernhard's novels is the wish to appreciate again how each is set in motion. The Loser begins like this. Even Glenn Gould, our friend and the most important piano virtuoso of the century, only made it to the age of fifty-one, I thought to myself as I entered the inn. There is the familiar subject matter of early death pressing on the narrator, which is compelling in a regular way and enough to distract one from the form, but the pressure is there too in the in medias res pulse of "Even", an unusual word with which to begin a novel ("Auch" begins the original, in case you're wondering), which gives a sense of urgency or desperation to the narration, but then there's the displacement of its immediacy in "I thought to myself" and the sarcastic italics around the cliché. It's an odd combination: dark thoughts and qualifying pedantry. In 1974, Gabriel Josipovici recognised the same dynamic in another author: "When we think of Saul Bellow's work, we think of a certain tone of voice, a tone of voice that combines the utmost formality with the utmost desperation." This is also what draws me back to Saul Bellow's novels. Formality and desperation together – this is what I am drawn too. One alone might lead to muso chin-stroking over craftmanship, and the other alone might lead to down-to-earth endorsements for a tour de force of expressive brillance, but when alone neither is quite able to acknowledge their limits: one coats suffering in layers of well-wrought sentences while the other masks literary artifice by turning it up full blast with extremes of language or subject matter. By combining the two, one shows up the weakness of the other, as one end of a see-saw shows up the lightness and the heaviness of the other. In beginning The Loser like that, Bernhard sets the see-saw in motion, something that is both light and heavy, comic and terrible, and impossible to pin down. For me at least, reading like this becomes as fun as riding a see-saw. But not only fun. 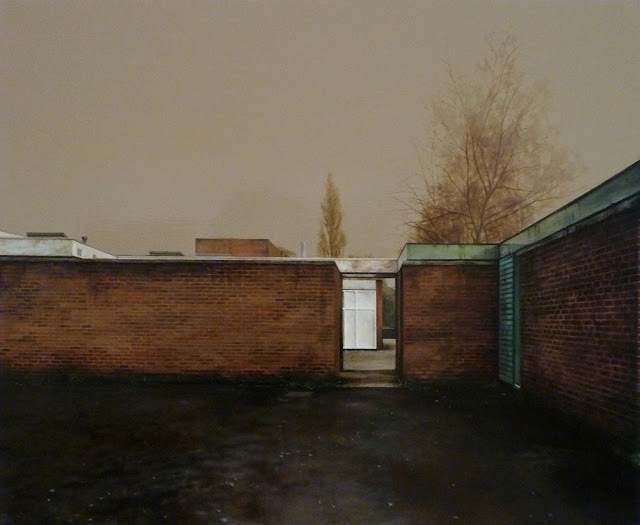 The combination of formality and desperation also drew me to this painting, especially as it captures the experience of a provincial working-class English childhood: the straight lines, the brick patterning, the muted colours, the limited horizons. 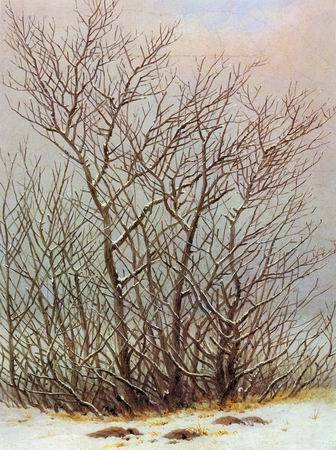 The title is said to provide "echoes of the melodrama and self-importance often characteristic of the adolescent" but it also echoes the latent holiness in Winter Landscape with Church by Caspar David Friedrich and, in terms of experience, Trees and Bushes in the Snow. You do not stand before a ‘landscape’ since the thicket blocks any wider prospect of its setting; nor do the snow and alders, pushed up against the picture plane, quite constitute the monumentality of a 'scene’, for they provide no habitat for an event. 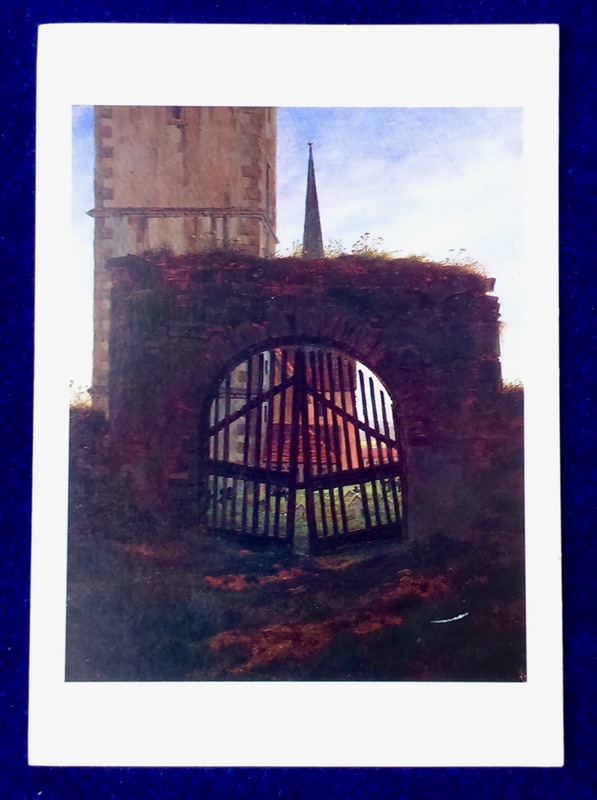 Looking back, it doesn't seem to be a coincidence that, when I visited the Kunsthalle Bremen, the only postcard I came out with was one of Friedrich's Das Friedhofstor. Could formality be the echo of enchantment and desperation the wall? Proust had given me the confidence to fail, had driven home to me the lesson that if you come up against a brick wall perhaps the way forward is to incorporate the wall and your effort to scale it into the work. I had read Robbe-Grillet and Marguerite Duras, and been excited by the way they reinvented the form of the novel to suit their purposes – everything is possible, they seemed to say. But when you start to write all that falls away. 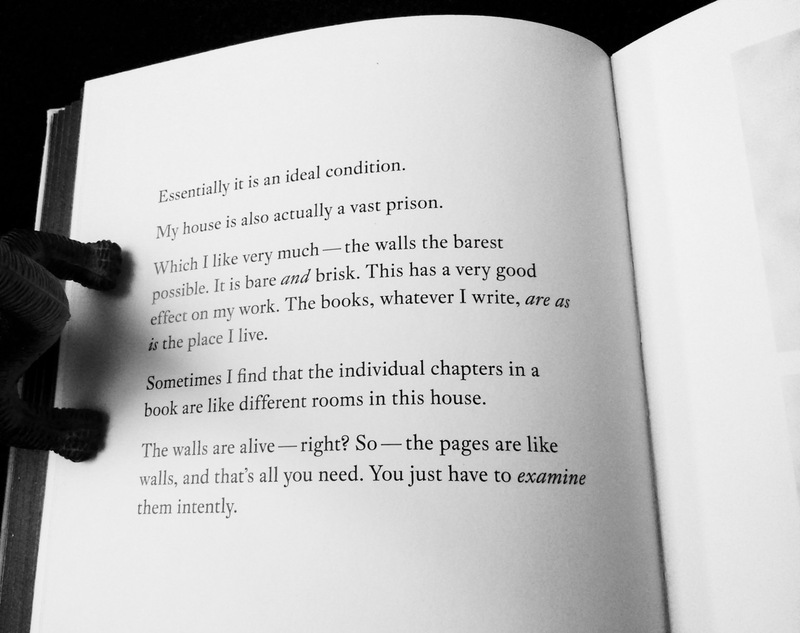 You are alone with the page and your violent urges, urges, which no amount of reading will teach you how to channel. ‘Zey srew me in ze vater and I had to svim,’ as Schoenberg is reported to have said. That is why I so hate creative writing courses – they teach you how to avoid brick walls, but I think hitting them allows you to discover what you and only you want to/can/must say. What draws me back to Bernhard is to appreciate his discovery and how he incorporated the brick wall. Re-reading his first novel seems to have helped with that. Frost was published in 1963 but was the last to be translated into English. This might be because it isn't quite like those that define his style and certainly not as economic. It is the narrative of a medical student visiting the ageing painter Strauch who has lived for many years in an Austrian mining town. The student's task is to report back to the Strauch's estranged brother, and the novel takes the form of a diary of his encounters with Strauch, who is prone to monologues. The book is divided into twenty-six chapters representing twenty-six days. Compare the following paragraph from the day seven with the one from The Loser. Bernhard has always displaced the dominant character's voice in a novel – Prince Saurau who appeared four years later in Gargoyles is the most memorable. Yet even when the dominant character is the narrator, as it tends to be in his later novels, it too is displaced, either in time, as in the "I thought to myself as I entered the inn", or in writing, as in the "writes Atzbacher" in the first line of Old Masters. But earlier works like Frost and Gargoyles are relatively routine in terms of style and are distinguished mainly for the eloquence of their expression of existential despair. Strauch describes paranoid hallucinations and the student is reporting back; nothing unusual here. Seven years after Frost, however, in a film also divided into days, Bernhard more or less repeats Strauch's experience as his own, which offers an insight into the shift in style. On day two, he says he prefers to be alone. 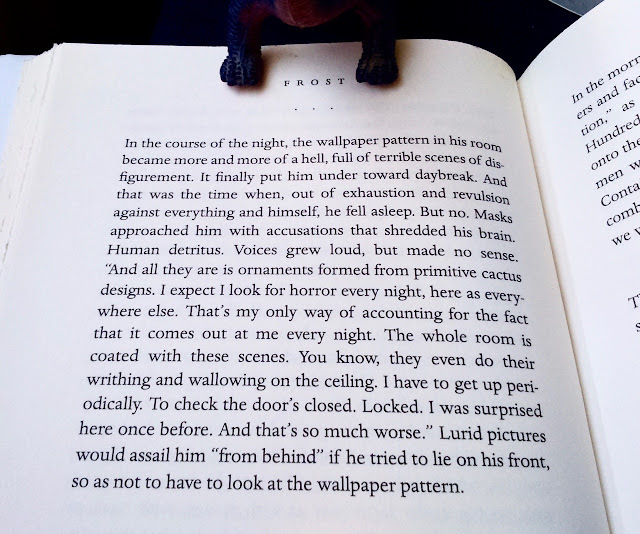 For Strauch the wall held Technicolor horrors from which he turned away, and perhaps they were for Bernhard himself and this is a displaced expression of that. For the slightly older writer, however, the horrors became a source. 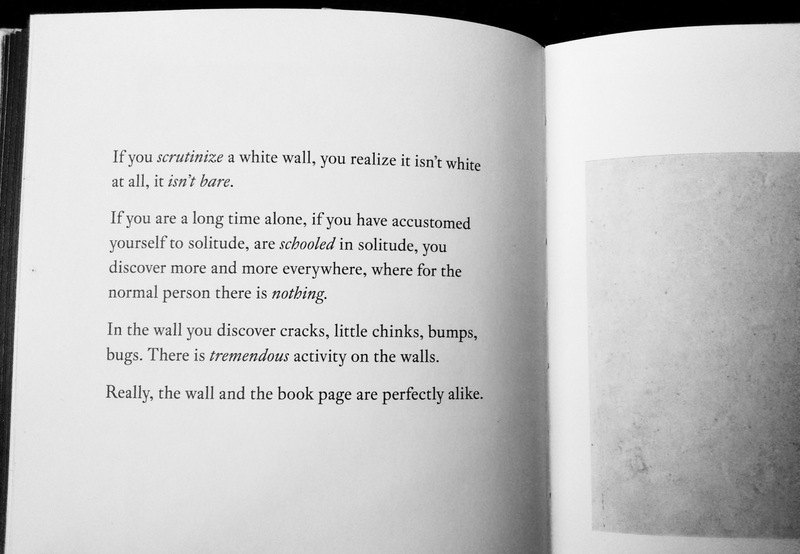 Wall and page are 'perfectly alike', so his books are made of walls, not their overcoming. There is no wider prospect because a singular voice blocks the reading plane. Here's the dominating voice of Old Masters, the music critic Reger, who spends his days studying each painting in the Kunsthistoriches Museum just as Bernhard studied each wall in his house. George Steiner felt that Bernhard lapsed into a 'monotone of hate' in his later work, which is understandable given how close Bernhard gets to the wall here, and also given Steiner's highly pitched regard for what is a necessary part of that proximity. But while Reger's critical mania is easily conflated with Bernhard's own, it too is placed at a distance, with Reger's opinions noted down by his friend Atzbacher and orchestrated by Bernhard, and therefore contained within what could be included among "the very greatest and the most important creations" that Reger treats with such suspicion. Such displacements might be considered a serious flaw in a modern novel, as they evade positivist claims about the world and decline to tell convincing, realistic stories to reflect the world back to us, or conversely they might be celebrated by those who see only a pass-the-parcel game of attribution. But what we have is walls in motion, something as fun as riding a see-saw. But not only fun.